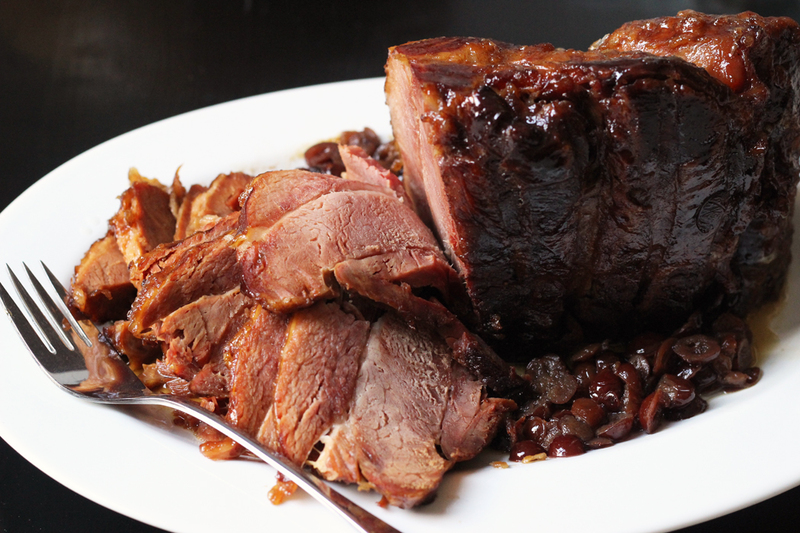 Got leftover ham from a holiday dinner? These recipes are perfect for using up your ham in easy and delicious ways. Save money and enjoy some fantastic meals. Ever since my kids watched Ponyo, someone is likely to jump up and down and shout, “Haaaaam!” whenever I mention the lovely cured meat that we indulge in as a festive holiday meal a few times a year. I usually cook my ham in the slow cooker at Thanksgiving and Easter, but thanks to the lovely half hams that Costco stocks year-round, ham is a regular feature on our table all year long. And it’s played a big part in our travels abroad. While I don’t see ham as a menu option too often here in the states, it seems to be everywhere in France and England. Good thing we love ham! Many of the leftover ham recipes we love are inspired by our travels overseas but also by my desire not to waste food. They say that we Americans waste up to 40% of the food we buy. If that’s the case, then we could save some serious coin using things up well. It’s good for us that ham is super versatile and packed with flavor. Just a wee bit adds a delicious combination of sweet and salty flavor to any number of dishes. Around Thanksgiving, Christmas, and Easter, you should see hams on sale in your local stores. It’s as low as 99 cents/pound in my neck of the woods. It’s been lower in the past, but that’s still a good deal. When I buy a ham, I serve it as a main dish the first time. Then we chop or slice the leftovers to freeze in small bags in the freezer. 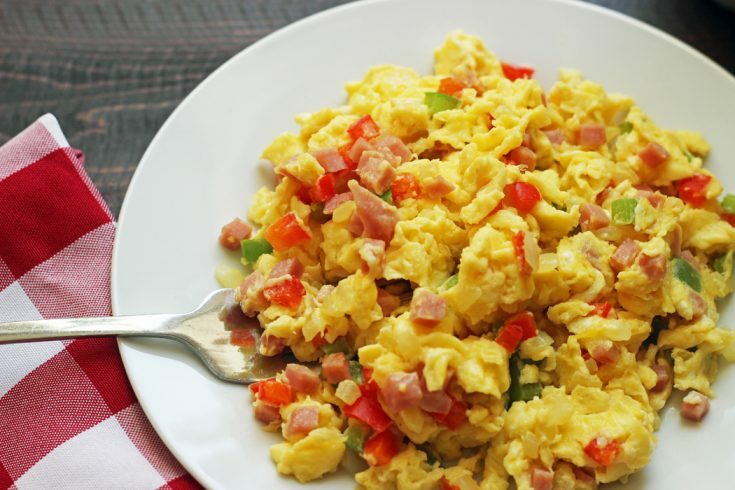 That makes it easy to stir a little into scrambled eggs or toss some onto a pizza. Once you’ve served your holiday ham, package up the leftovers right away. 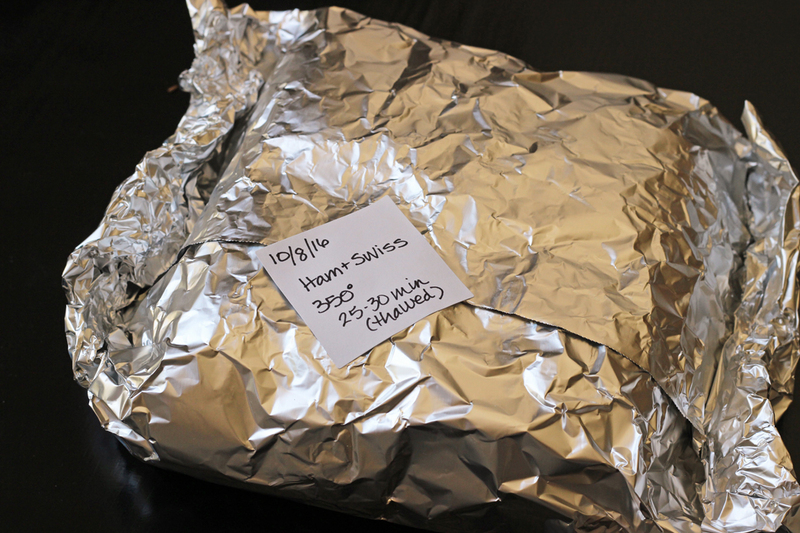 How do you store leftover ham? You want to make sure to wrap the ham tightly in plastic wrap or a covered container and refrigerate it as soon as possible. Be sure to not leave the ham at room temperature for more than 2 hours. Prepared food is good in the refrigerator for up to 4 days. Dating your leftovers is a good way for you keep track of its shelf life and make good use of it. If you’re not going to use the leftover ham within the time recommended, then be sure to freeze it! Can you freeze leftover cooked ham? Freezing leftover cooked ham is a great way to extend its shelf life, allowing you to use it over several months instead of having to eat all the ham things in just a few days. Simply dice or slice the leftovers, wrap well in plastic wrap in meal-sized or recipe-sized portions. Slip the wrapped packages into a large freezer bag and stash the ham leftovers until another time. Be sure to label the package so you know its contents and when you froze it. If you’re feeling a little more ambitious, prepare some freezer meals that include ham and stash those away for another day. What can you do with leftovers? 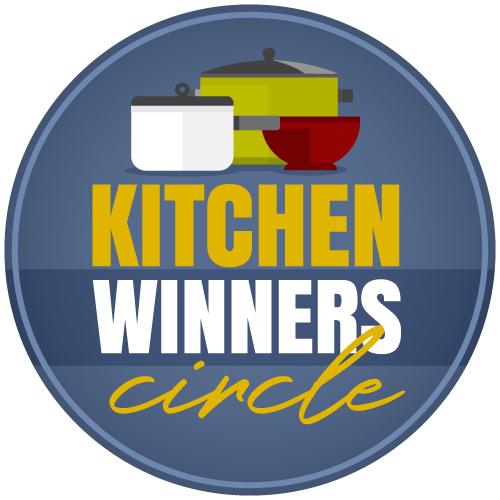 There are so many great recipes for using up leftovers. 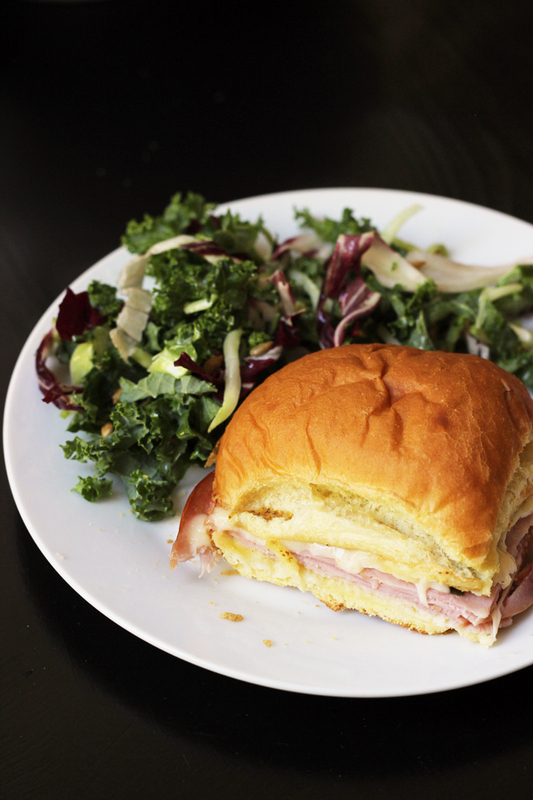 I’ve rounded up some of my favorite leftover ham recipes here. They’re so good, you’ll want to serve ham every week of the year! 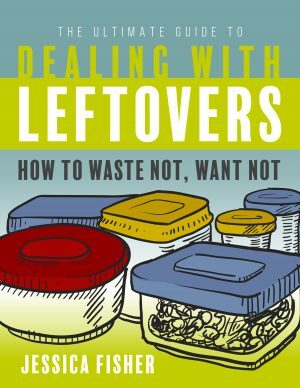 If you decide you want to up your game in the leftovers department and save even more money, grab The Ultimate Guide to Dealing with Leftovers: How to Waste Not, Want Not. 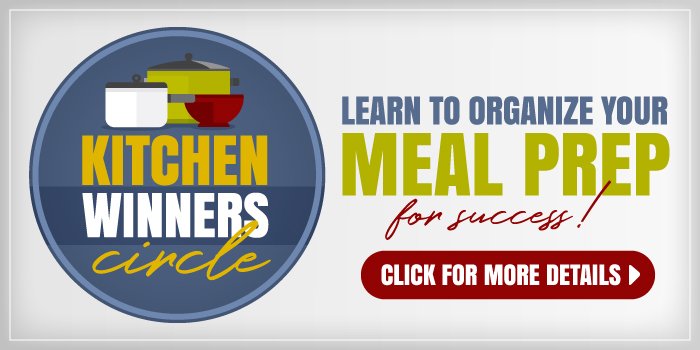 This quick read will help you know how best to package prepared food to help it last as well as give you concrete ideas as to how to use it up. Sandwich Night need never be boring, particularly when you’ve got a stash of these spicy Ham and Swiss Sliders on hand. These small but mighty sandwiches, packed with ham, swiss cheese, and spicy horseradish mustard are freezer-friendly delicious! 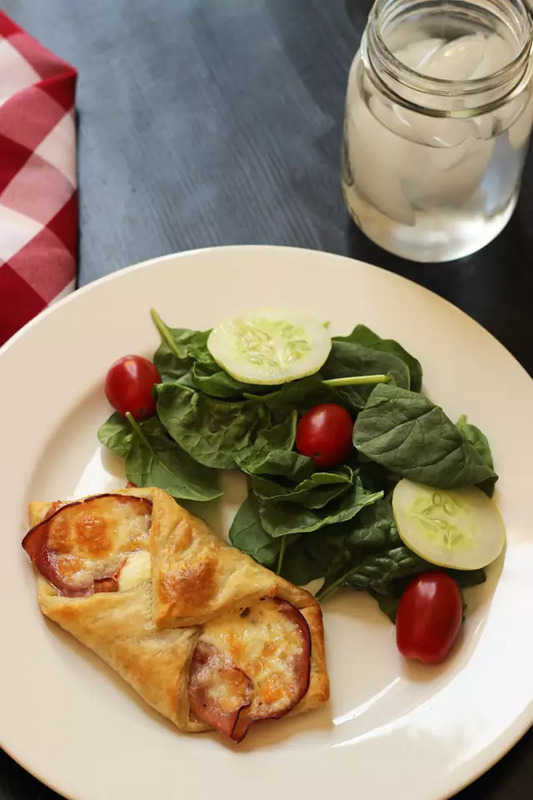 These ham and cheese foldovers are incredibly easy to make. These quick to assemble ham and cheese croissant-type sandwiches are elegant as well as delicious. 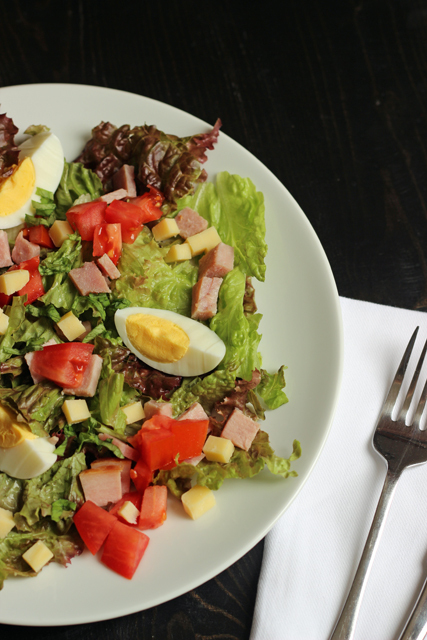 Diced Ham, Gruyere Cheese, and Dijon mustard pack this salad full of flavor. You will be surprised how something so simple can taste so fabulous. Ham and eggs never tasted so good! 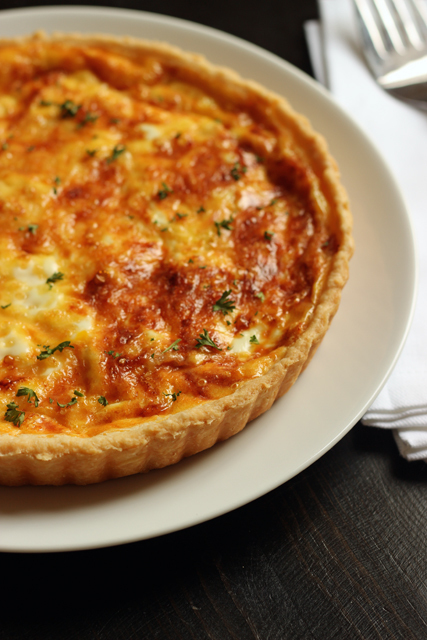 Mix up a Ham and Gruyere Quiche for breakfast, lunch, or dinner. It tastes great any time of day. 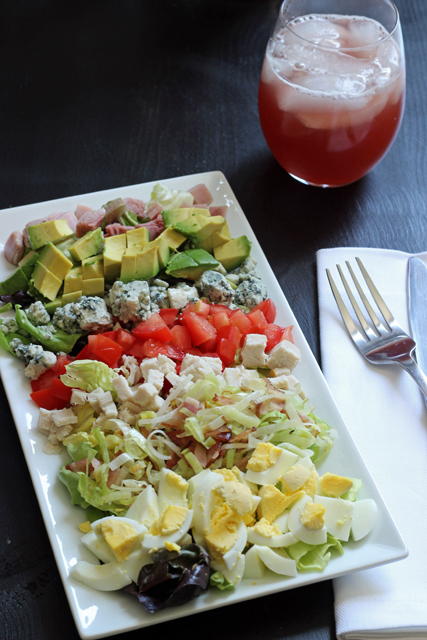 A Cobb Salad is full of flavor so it never need be boring. This one with ham and turkey gets dressed up with bacon and leeks. 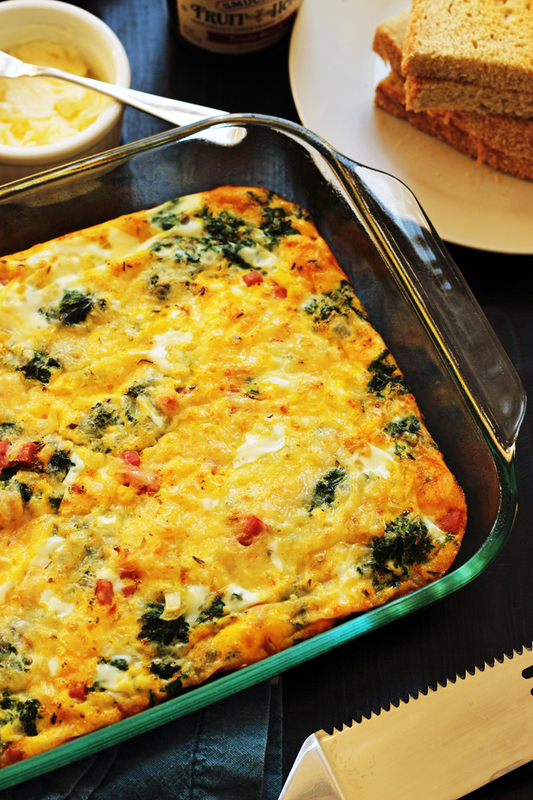 Breakfast, brunch, or even dinner will be cozy and delicious when you serve up this Ham and Spinach Egg Bake. It’s super easy to pull together in minutes. 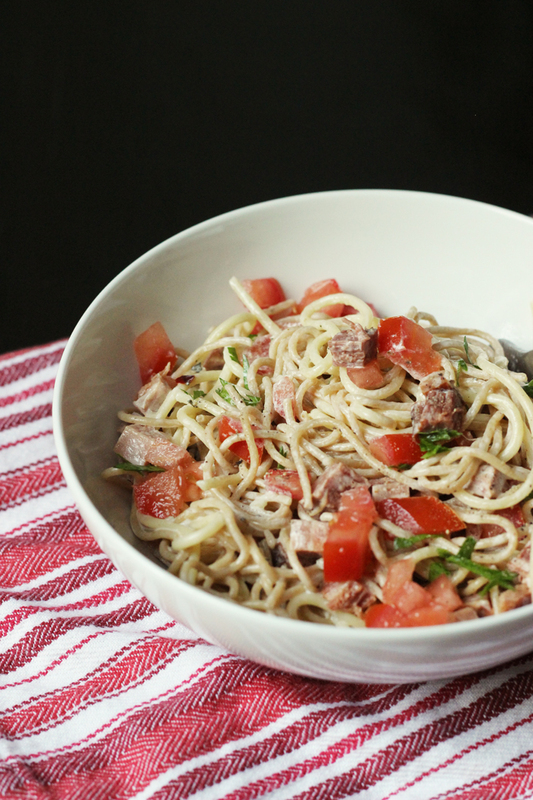 This pasta dish is the result of a pantry challenge when I put leftover spaghetti and ham from the freezer to good use. I had a tomato and basil from the produce box and just a bit of cream to make a delightful carbonara-esque pasta dish. I know this California Chicken Gumbo for a Crowd isn’t “authentic” but it sure is good. The fact that it cooks in the slow cooker is an added bonus, so you can just set it and forget it. I still dream of this salad that we had at Zizzi in London. It’s so good! 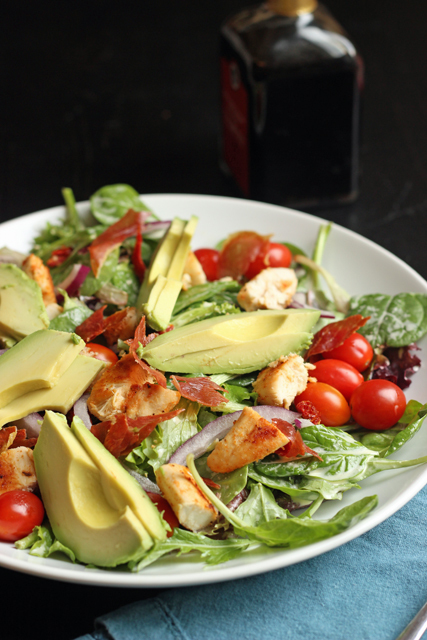 You can easily substitute chopped ham for the prosciutto in this Chicken and Prosciutto Salad. Denver Scramble is one of the tastes of my childhood. It’s basically a Denver Omelet for the omelet-impaired. So filling, it works for breakfast, lunch or dinner. This delicious comfort food is basically a dressed up grilled cheese sandwich. But, oh my! 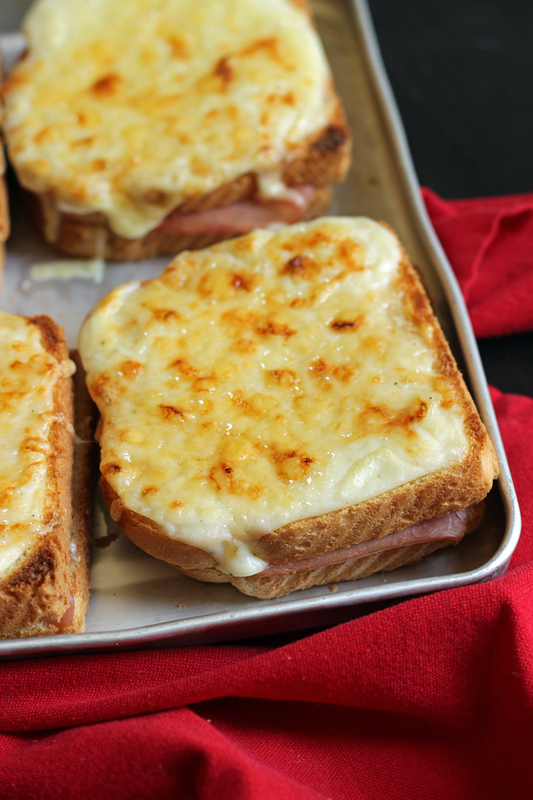 The Croque Monsieur is so much more than that. 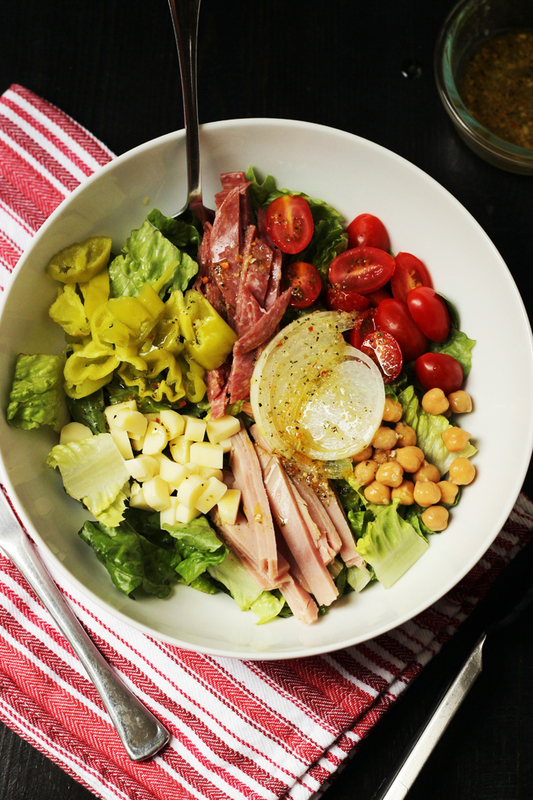 While prosciutto is certainly not the same as ham, thinly sliced ham can serve as an affordable substitute in this salad which is super delicious and packed with fiber. Keep things simple with a snacky dinner. 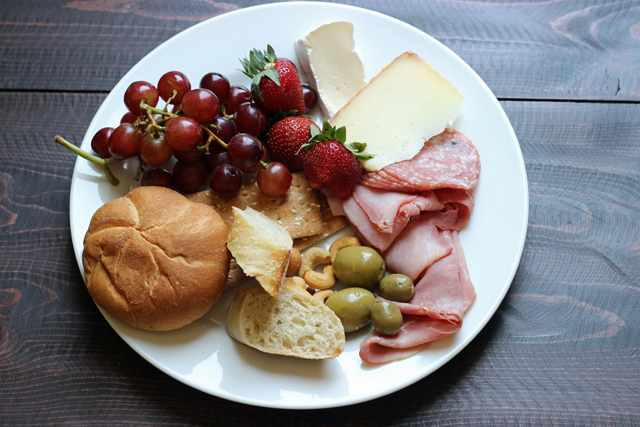 A nice selection of ham, other meats, cheese, fruit, and breads can make this easy meal feel special. Submarine Salad: You Won't Miss the Bread! 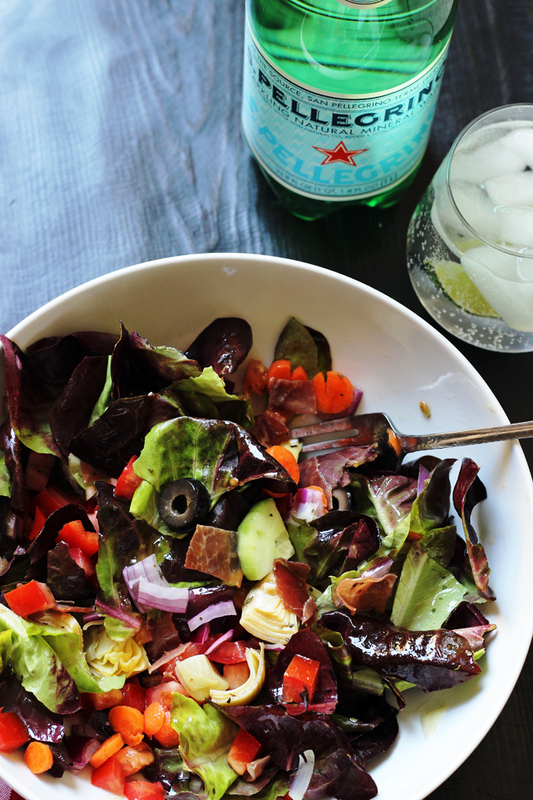 Ready for a salad to knock your socks off? This Submarine Salad is it! The best part of a sub sandwich is the meat and veggies and abundant Italian dressing. You have all those in this tasty Submarine Salad, so good you won’t miss the bread! 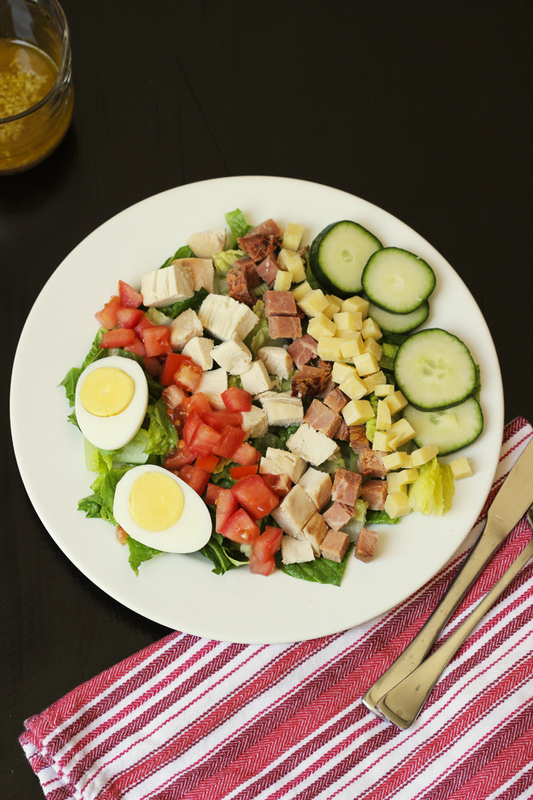 A typical chef’s salad boasts hard-boiled eggs, cucumbers, tomatoes, cheese, and meat on a bed of dressed greens. This version features a garlicky anchovy vinaigrette that adds some punch to the melange. 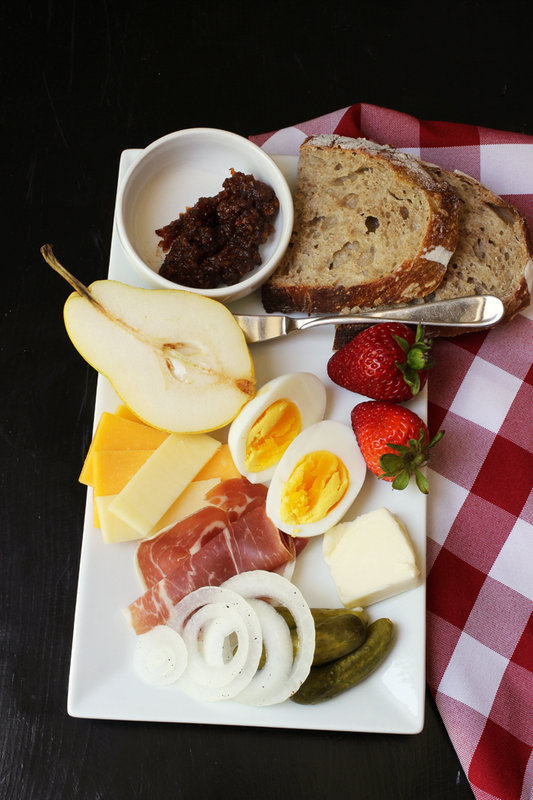 The Ploughman’s Lunch, aka Ploughman’s, is the UK version of the Snacky Lunch. What was once a laborer’s meal now looks like a very posh cheese and meat platter. Make your own at home for less! This is my take on a favorite Club Sandwich from a now defunct restaurant in Paso Robles. We love the combination of soft and crisp textures with a hint of smoke from the bacon and sweet from the tomato. 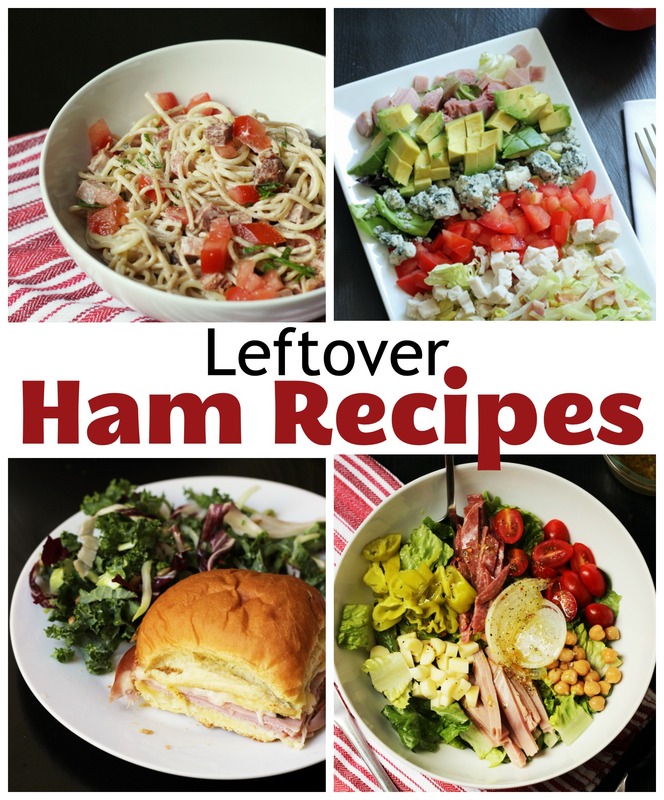 What’s YOUR favorite leftover ham recipe? Cook noodles and drain. Return to pot. Butter coat a large casserole dish. Sautee in 2 TBS. oil, peppers and onions till soft. Combine egg with sour cream. To pot, combine noodles, ham, peppers, onions, mushrooms, swiss cheese, salt and pepper, egg and sour cream; Toss well. Pour into casserole and dot with butter. Top with parmesan cheese. Bake at 350 for 30 minutes covered. Remove cover and cook an additional 10 minutes. In a large pot, bring the water, potatoes, carrots, celery, onion, salt and pepper to a boil. 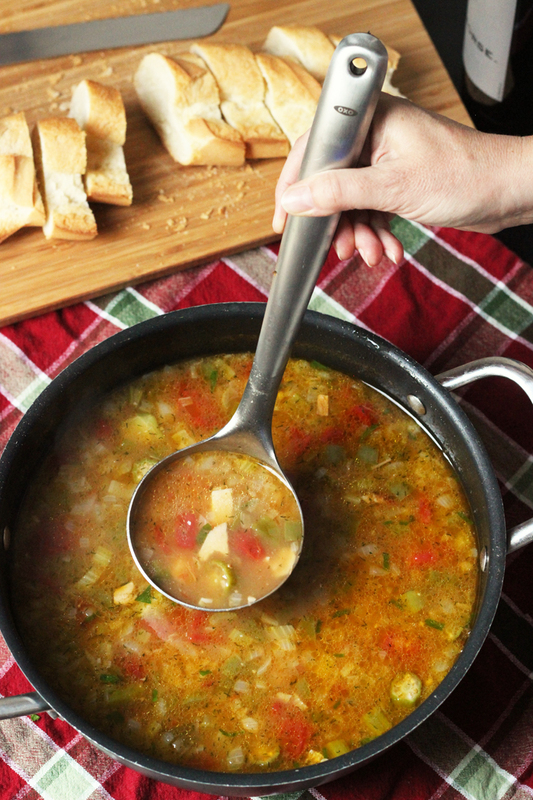 Reduce heat; cover and simmer for 8 – 10 minutes or until vegetables are just tender. Remove from heat; do not drain. In a medium saucepan, melt the butter. Blend in flour. Add the cream all at once; cook and stir until thickened and bubbly. Add cheese and stir until melted. Stir into the un drained vegetables; return large pot to the heat; add corn and ham, heat thoroughly; stirring occasionally. Chop ham into tiny pieces; add chopped pickle and mayo. Spread on a thick and crusty bread. Yum! But this year, I am going to try the very delicious looking croque monsieur sammies. They look so wonderful and I know my family is going to love these, for sure. Maybe some tomato basil soup to go with it. I’m in agreement with Stephanie on spiral cut hams. We just don’t like them nearly as much as bone in butts. 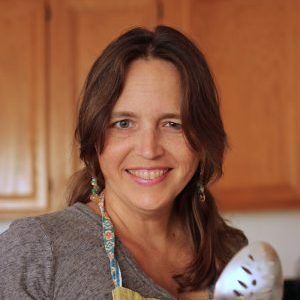 Our ham salad is similar-I put ham odds and ends (fat removed) into the food processor with dill pickles, green onion, and mayo and give it a spin. It is so addictively good on crackers, squishy white rolls, and in sandwiches. No need to add salt-it is plenty salty and delicious. We also add leftover ham to jamalaya, along with leftover chicken or shrimp. When we were in France years ago we loved Croque Monsieurs. I’m happy you included the recipe. Thanks. 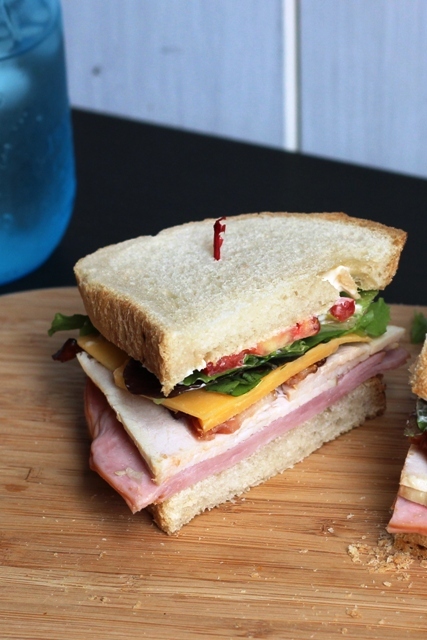 We have several recipes for leftover ham. Our favorites include ham and potato soup; deviled ham sandwiches; ham and pinto beans; and ham tetrazzini. Hands down Ham and Bean Soup! Sounds like such a fun party!